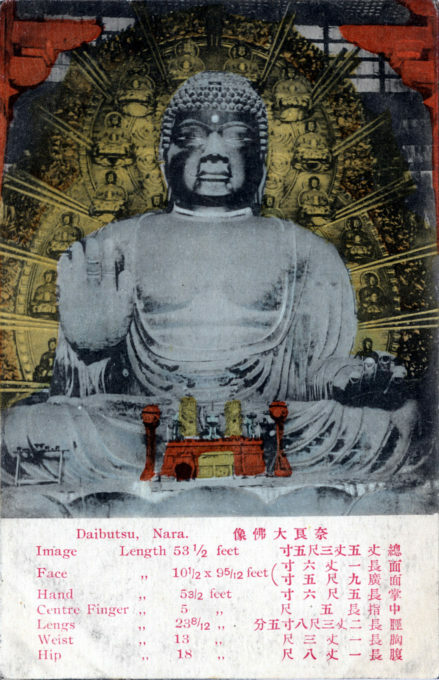 “The Nara-no-Daibutsu [Daibutsu of Nara], a great bronze image representing Roshana Buddha (Birushana-butsu), the God of Light, sitting on an open lotus bloom in an attitude of calm reflection, is the largest of its kind in Japan, and is perhaps one of the greatest in the world. As a work of art it is inferior to the companion image at Kamakura and superior to that of Kyoto. “It was erected in 749 at the instance of the (45th) Emperor Shomu (718-58), and contains 500 lbs. of gold; 16,827 lbs. of tin; 1954 lbs. of mercury; 986,180 lbs. of copper; an unrecorded quantity of lead; and is said to weigh approx. 500 tons. The gold and mercury were used solely for gilding. It is 53-1/2 ft. high; 18 ft. across the breast, with a face 16 by 9-1/2 ft.; mouth and nose, each 3 ft. 9 in. wide; eye, 3 ft. 11 in. ; and ear, 8 ft. 6 in. The features are Negroid and suggest Hindu inspiration. “Two years were required to cast it; the Emperor carried earth with his own hands to help make the platform, and after 7 unsuccessful attempts the idol was at last completed. The head and neck were cast in a single shell. The body was formed of plates 10 by 12 in. and 6 in. thick, built up in the form of walls, and cooled a foot at a time. The temple erected the following year to shelter it was soon burned. The present colossal structure (one of a long dynasty) dates from 1913 — at which time the image was cleaned and renovated. The head was so badly damaged by one of the early fires that it was replaced in 1183 by a new one. Daibutsu Temple, Nara, c. 1920. “After Nikko and Kyoto, Nara offers greater attractions to tourists than any place in Japan. Its natural beauty is exceptional and its historical interest vivid. It may be said to have been the first capital of Japan. “Up to the beginning of the 8th century, the Imperial Court changed its location at the accession of each sovereign, and the Court’s place of residence naturally became the official metropolis. A city whose life was limited to the duration of a single reign, could not possibly attain any commercial or architectural vestiges of greatness. 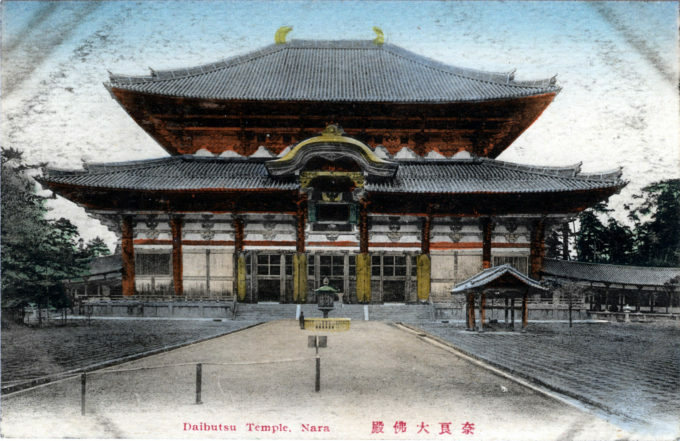 But Nara remained the metropolis during seven reigns (709 to 784 a.d.), and its seventy-five years of existence sufficed for the building and furnishing of many imposing shrines and temples, the laying out of a noble park, and the casting — after seven unsuccessful attempts — of a colossal image of Buddha, which now stands in the temple called Todaiji, and enjoys the reputation of being the biggest thing of the kind in Japan.